Die Co. tube clips and tube clamps hold tubes firmly in place and help secure tubes where you want them, without putting too much pressure on them or damaging them. Tube clamps snap shut around tubes and are held closed with a screw or rivet. Tube clips slide easily over the tube, gripping tightly with their spring steel legs. They can be removed just as easily with a firm tug. 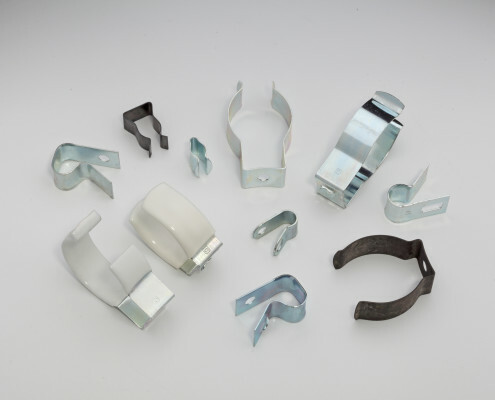 Browse the selection of Die Co. tube clips and clamps in our product catalog, contact us to customize a tube clips and clamps for your application or check for a competitor part on our cross reference list. Learn more about Die Co. tube clips and clamps and find part numbers in our product catalog or check for a competitor part on our cross reference list.